There are literally hundreds of different ways to make money in the stock market — but too many people forget all the different ways that you can potentially lose money in the stock market. Just like understanding risk and reward, investors need to understand both how to make money in the stock market, as well as how to lose money in the stock market. While some of these are very simple and straightforward, others are more complicated, while another set focuses on lost opportunity costs. 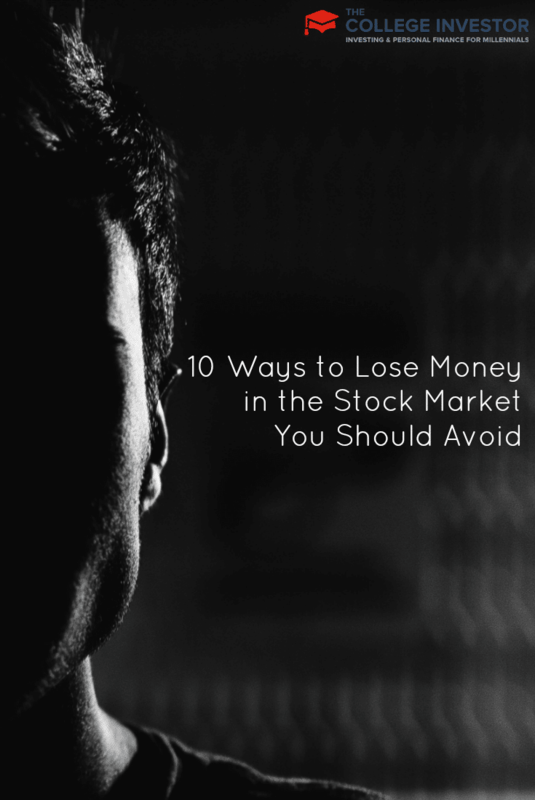 Here’s what you need to remember about losing money in the stock market. Everyone knows that the way to profit in the stock market is to buy low and sell high. So, as the inverse, the key way to lose money in the stock market is to buy high and sell low. You can lose money this way with every type of investment known: stocks, bonds, mutual funds, ETFs, options, futures, even art and collectibles. This is the most basic way that you can lose money in the stock market. How Much Can You Lose: The difference between the price you buy and the price you sell. Put more money into your account. Sell off some of your assets. This occurs because the value of the assets in your account has fallen below a certain level. If you take no action, your broker will automatically sell your investments to cover your margin call. There are two scenarios you should be aware of (although there are many more that could impact margin calls): a stock market crash and trading forex. If the stock market crashes, you could face a margin call and be unable to repay it. Chances are the market will freeze, and you could have difficulty accessing other assets to cover the call. Also, selling the assets in your account can occur at a huge loss. Second, if you trade in forex, the market is open almost 24 hours a day. As such, a price fluctuation could occur while you’re sleeping, and before you know it, your assets have been sold off. I’ve known many forex investors who’ve woken up to having their positions sold off overnight to face a margin call. How Much Can You Lose: The difference between what you paid for the securities and what your bank sold them for to pay the margin call. For the past several years, real interest rates have been negative. What this means is that the amount of money you will earn in interest in your savings account is less that the rate of inflation. In real terms, you will earn about 0.10% interest by having your money in a savings account, but inflation is raising prices by 1.5% per year. As such, there is currently a negative interest rate of about 1.4%. What does this mean, and how do you lose money? If you can’t earn a return higher than prices are rising, the purchasing power of your investment is negative, and as such, you’ve technically lost money. For example, when you start investing, you can buy a loaf of bread for $3.00. Over the one year, your $3.00 has increased to $3.003, but the price of bread has risen to $3.045. You’ve essentially lost $0.042 in purchasing power. It might seem like a paper loss, but if you’re relying on your investment income to support you (say, in retirement), that is a real loss. How Much Can You Lose: The difference between inflation and the rate of return on your investments, multiplied by the value of your investments. Similar to real interest rates, the impact of inflation can impact another segment of investors. If inflation does get out of control, investors can take a real hit on their investments because they won’t keep pace with the real value of the money. Just remember our article on hyper-inflation and the impact on your portfolio. Poor monetary and fiscal policy can lead to this becoming a reality, and it can cause you to lose a substantial amount of money. Currency devaluation occurs when a country opts to make their currency cheaper relative to other currencies. This often happens because of the implications of policy decisions, along with the effects of market forces on the country. Devaluation is typically viewed as a sign of economic weakness, since poor policy decisions and a weak economy typically contribute to devaluations. Forex investors can lose money directly because of the changes in exchange rates. Cheaper exchange rates lower imports into the country and increase exports, which could change trade balances and impact different industries. How Much Can You Lose: In forex, you can lose the amount of your initial trade to the final exchange rate, and also be subject to margin calls. Defaults happen when a bond issuer can no longer pay the interest on their bonds (or refuse to pay the interest on their bonds). This is significant for fixed income investors — those who invest in bonds. The biggest risk for this type of investor is the risk of default, because not only do you lose the income from the interest, you also potentially lose the principal on the bond, and whatever principal you’ll receive will be the result of legal proceedings. The risk is minimized by investing in bond funds, which hold a basket of bonds, and thus reduce the risk of the impact of a single default. How Much Can You Lose: Potentially the full value of the bond. Commissions are a straight loss of money in the stock market. Every time you place a trade (unless you qualify for special promotions), you’ll have to pay a commission. This automatically causes a loss on the investment. For example, if you want to invest $5,000, and it costs you $7 to trade, you are starting your investment at $4,993. The best way to avoid this (or at least minimize it), is to use one of our cheap investing sites and minimize the cost of commissions. How Much Can You Lose: The amount of the commission. Fees are another way that you automatically lose money in the stock market. If you invest in a mutual fund or ETF, you are automatically paying fees on your investment. A good fund will have fees of less than 0.35%. However, some mutual funds have fees in excess of 2%. If you own a mutual fund with an expense ratio of 1%, and you have $10,000 invested in that mutual fund, you will lose $100 per year in fees by just holding that investment. Want to know how quickly fees will eat up half your portfolio? Remember our quick rule of 72 for investing! How Much Can You Lose: The amount of the fee multiplied by the amount you have invested. We’ve talked about using options to supercharge your portfolio before — and this strategy involves selling call options on your existing stock holdings. However, you can lose money in this strategy due to the possible opportunity cost from this trade. When you sell a covered call, you are agreeing to potentially sell your stock at a specific price. Say you own a stock, XYZ, and it is trading at $55. You sell the $60 call option, and pocket the premium. However, say the stock shoots up to $70. You’ll be forced to sell the stock at $60, losing $10 per share. How Much Can You Lose: The difference between the share price minus the option strike price, plus any option premium you received. Another options strategy that can potentially lose you money in the stock market is selling naked puts. If you sell a naked put, it means that you sell the put without owning the stock. If the price of the stock stays above the strike price, you are golden. However, if the price of the stock drops below the strike price, you’ll be forced to buy the stock at the strike price. The maximum potential loss from this strategy is if the underlying stock price goes to $0, in which case you will lose the strike price minus the premium received. How Much Can You Lose: The difference between the strike price and the share price, minus the premium received. Remember, their are countless other ways that you can lose money in the stock market — but most are variations on the themes listed above. Investing in the stock market does not guarantee you any potential future returns, and as an investor, you need to be aware of the risks involved. 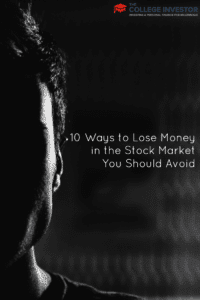 How have you lost money in the stock market? Any ways that I’m missing? I think inflation and costs are the really big ones here. Inflation because people think their investments are “safe” when they’re really just getting destroyed by inflation. Costs because they’re so damaging but also so easy to control. Its only bonds and deposit account holders who tend to get whacked with inflation. Most companies just increase their prices in line with their increasing costs. The stock market can be a good hedge against inflation. The stock market can be a good hedge against inflation, IF inflation is the only enemy. In many cases, inflation is combined with multiple issues, in which case stocks may not always outperform in an inflationary environment. Good ones Robert! I think all of these are vital to watch with your investing and the sad thing is that many do not watch them at all. I think #7 & 8 are key to watch as they really can eat into returns. The crazy thing is so many retail investors are only looking at return and don’t stop to think about how much fees or trading costs are eating into that. My biggest loss was back in the days of the dot-com bubble. I thought I could time the market and that buying momentum stocks was the road to riches. I went from around $300k in the early 90s to $860k in 1999. In 2000, I watched my assets drop by $100k in one day. I sold everything and bought into some tech mutual funds when I thought we had hit bottom. We hadn’t. My assets bottomed out at $140k. I think it was around 2008 that I found John Bogle and the low-cost Vanguard index funds. I have been much happier since. Great list. I would recommend everyone reads (if they haven’t already) monkey with a pin regarding fees and other matters which ensure that average investors severely under-perform the market! Great stuff right here. As important as it is to know how to make money from the stock market it it also essential to know the ways you can lose money. This is very useful indeed.